A Promise Between Friends - The Contract Between Writer And Loyal Reader. 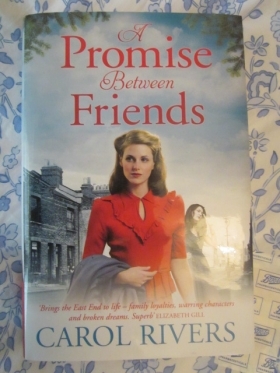 A Promise Between Friends is the title of Carol Rivers' latest East End saga, but it strikes me that a promise between friends also sums up the "contract" between a successful author and her or his loyal readers. Contract? Well, yes. As a reader, you want your favourite authors to provide you with compelling, worthwhile novels on a regular basis. Maybe "contract" is too strong a word. Maybe "agreement" or "understanding" is more apt. But whichever piece of vocabulary you prefer, the point is the same. We have all experienced the disappointment of a favourite, trusted author's latest book being not as good as the previous ones. Writing a disappointing book can be a one-off, of course, but in my reading experience, it's more likely to signal the start of a writer's going off the boil. I'm thinking now of a successful thriller writer whose books I read with enormous pleasure for around a dozen years. Then came the day when, near the beginning, I was able to predict an important event that was going to happen at the end - the first time I had ever done so in one of these books. No matter. I still loved reading it, and also the next one the following year. But when I read the one after that, I found myself skipping bits, something I'd never done before with this author. And for me, that was the beginning of the end. Although I have the first 15 books on my shelf, I don't have the others. When an author has been a part of your reading life for years, it's an unpleasant and sobering experience recognising that the time has come to part company. Then there's a prolific author of sagas whose books I have enjoyed since she started writing some 20 years ago. The trouble is, she is now churning them out and the plots are strikingly similar. Yes, I still read them, but they don't absorb me to anything like the same degree as her earlier books. Moreover, now I borrow them from the library and no longer buy my own copies to keep. So what is it that binds an author and reader together? Well, obviously, it's the quality of the books. That's the author's part of the contract. The author promises to write the best, most captivating novel she or he can. 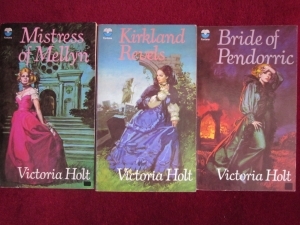 ... and when I was in my teens, Victoria Holt's wonderful gothic novels were always a good read. 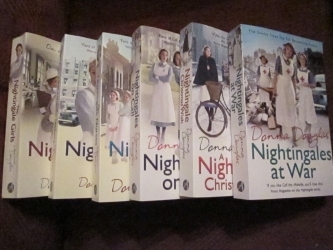 More recently, the Nightingales series by Donna Douglas goes from strength to strength. And Carol Rivers can always be trusted to produce an engrossing saga - and I use the word "trust" on purpose. That trust is an essential part of the relationship between author and regular reader. But what about the reader's side of this promise between friends? This is more difficult to quantify. After all, it's the writer's job is to produce the goods, but the reader isn't under any obligation to enjoy the book. I think the reader's side of the promise lies in a willingness to meet the writer halfway, to enter into the world of the book in a spirit of openness and with the assumption of enjoyment. And yes, the two sides of the agreement are quite different for reader and writer in terms of effort. The writer does all the work in the hope the reader will love the end result. But readers can redress the balance and contribute to the contract by spreading the word about favourite authors and outstanding books. So, in the spirit of making the most of my side of the bargain, here is my review of the novel whose title inspired this blog. 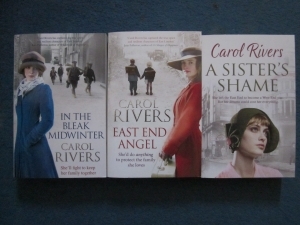 There are some authors who have a tendency to reproduce the same themes and ideas from one book to another - and then there's Carol Rivers. Every one of her novels is different and distinct in its own right and A Promise Between Friends is no exception. Carol creates 1950s London with a deft hand, writing in a fluent, readable style that draws the reader deep into the story. Ruby is an engaging heroine whose life is coloured by the bereavement and subsequent emotional difficulties that overshadow her family, but who nevertheless is propelled by her hopes and dreams. I found A Promise Between Friends intriguing. It tells a story in which people are not necessarily what they seem and therefore the plot develops in unexpected ways. How refreshing to read an unpredictable story! This is a compelling character-driven drama written with skill, vividness and compassion. Perfect for saga readers. I'm just catching up on your blog after my holiday and a busy week back, Sue, so apologies this is late. What an interesting post! I hadn't thought of the author-reader relationship like this before and particularly like the expression 'promise between friends'. I shall look for Carol's latest book after your review - you know I'm a big fan of sagas! Thank YOU, Susanna for sharing a stimulating week of comments and insights. Wendy mentioned what it must be like for an author to try to ring the changes with each novel, but one day, it would be fascinating to hear how our skilful host has compiled so many of our favourite topics over time. Imagination and flair, yes, but the foundation is a natural talent for engaging with people and their passion. Which brings us back to the current topic of promises between friends - and the reader and writer experience. Nail on the head once again, Susanna! You've opened up my idea in a way I hadn't expected, Jen. You're right - there's more to it than just the reading experience. As readers, we like to feel that the authors who write our favourite books are people whose company we would enjoy. Thanks for finding the time to visit my blog. I know how busy you are at present with your editing. Such an interesting post, Susanna, that has given me much food for thought. I hadn't thought about the author-reader relationship in this way but it's apt. The idea of a "promise between friends" extends beyond books too. It's in every interaction authors and readers have...at a book signing, through social media, at a conference. Meeting a favourite author and discovering they're as lovely as their books is very special and adds to the reading experience. A very interesting point, Wendy. We've all heard of second novel syndrome, but it must be especially hard for those writers who have had a particular success with their first book. I like your use of the term "added value." That is what loyal readers are looking for. It must be the hardest thing in the world to keep readers happy time and time again. When new ideas fail to come, it must be so tempting to trade on your name and write to a formula that has been successful in the past but with no added value. I also think it must be incredibly hard for the author who has a mega hit with their debut... how on earth do you follow that without disappointment? What an interesting point you make, Jessica. I hadn't thought of it that way round, but I can understand what you mean. Congratulations of the publication of Dreaming About Daran. I loved the first two books in your Whitsborough Bay trilogy and I'm looking forward to reading Clare's story in the third one. I haven't visited your blog for a while so apologies for this. It's been a crazy few months. Loved this post. I know exactly what you mean. I've experienced the same disappointment with more recent books of a writer I've loved for years. I've had it in reverse. There's a thriller writer whose work I started reading many books in. I loved it that she presented several people who could be the murderer and I usually guessed the wrong one. However, I picked up some of her early work in a discount bookshop and was really looking forward to reading it but it seemed very amateurish compared to her later work (my starting point) The bad guy was signposted so clearly that it absolutely ruined my enjoyment. To be fair, I didn't know why, but I knew who immediately. It hasn't stopped me reading her later work but it absolutely put me off her early work! Carol, how wonderful to hear from you. I'm delighted that you approve of my blog. I think your phrase "author longevity and reader satisfaction" perfectly sums up the point I wanted to make. As readers, we have a great deal invested in our favourite writers. We want them to write wonderful books and a small part of us feels crushed when they don't. I'm happy to say you have never let me down. Many thanks for dropping by and commenting. Thanks for your kind comment about my book review, Louise. I must admit I am always careful when I read a review not to read the plot bits closely so as not to spoil the book, should I want to read it. Good to hear from you, as always. You are right, Susanna - it comes as a massive let-down when a favourite author writes a disappointing book. It's interesting to think of the author-reader relationship as a type of contract, but I do think contract is too strong a word. "Promise between friends" sums it up nicely. I liked your book review too - it makes a change to read one that doesn't give away plot spoilers!